For three intense days fifteen sound artists/researchers from all corners of the Montreal island came together and, under the direction of Kim Cascone, proceeded to mutate+generate artifacts of genetic processes. Using the framework of a genetic algorithm, each member's contribution interacted within this living computation system, producing a sonic pool that is the result of artificial life processes, as directed by each person's unique aesthetic choices. This emergent content - with the history, memory, choice of each member and of the system itself embedded in each sound - had then been weaved into a sonic tapestry by all members of the group for this special performance. 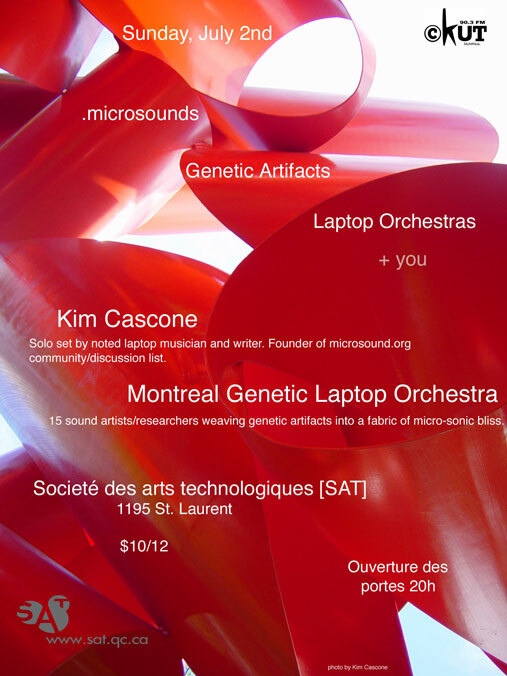 And thus was born the Montreal Genetic Laptop Orchestra! This sGA Workshop has been hosted at the New Music Building of the Centre for Interdisciplinary Research in Music Media and Technology (CIRMMT), Schulich School of Music, McGill University, Montreal, Quebec, Canada, from Thursday, June 29th to Saturday, July 1st 2006. The evening performance took place at the Society for Arts and Technology [SAT], Montreal, Quebec, Canada, on Sunday, July 2nd, 2006. Ce Workshop sGA a été hébergé au New Music Building du Centre pour la Recherche Interdisciplinaire en Musique, Média et Technologie (CIRMMT), Ecole de Musique Schulich, Université de McGill, Montréal, Quebec, Canada, du jeudi 29 juin au samedi 1er juillet 2006. La performance a eu lieu à la Société des Arts Technologiques [SAT] de Montréal, Québec, Canada, le dimanche 2 juillet 2006. Feel free to inherit, mutate, select, crossover... under the terms of a Creative Commons Sampling Plus 1.0 License.